Sundays are when we prefer to relax and eat out. For me it's the one day when I try out new recipes. 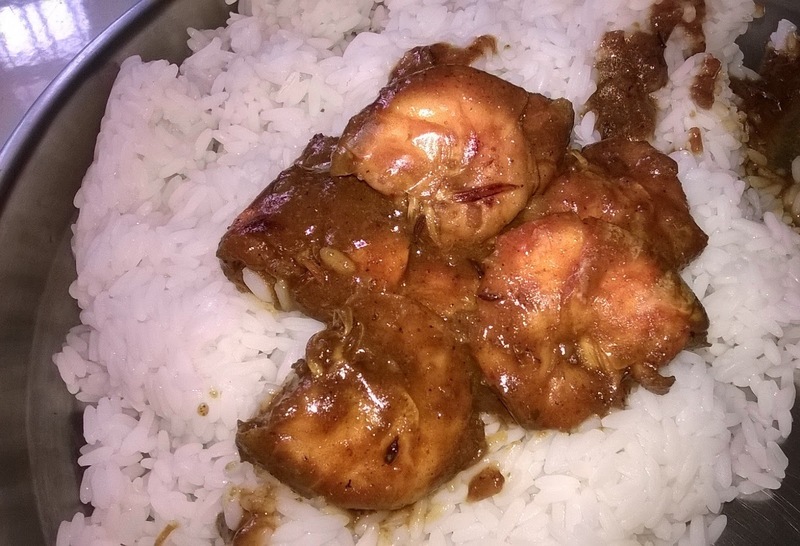 Now I have been planning to make the authentic and delicious Chingri Maccher Malaikari since a long time. But one thing stood between me and this dish. The coconut milk which is the most important ingredient after the chingri or prawns. I don't have the means to extract milk from the coconut. Someone told me of the readily available coconut milk powder but I did not get it in the local shops. A trip to Big Bazar at Patia, Bhubaneswar and there it was. The prized ingredient sitting on the rack proudly. I grabbed a couple of sachets of the Maggi Coconut Milk Powder and I was ready to prepare my first Chingri Malaikari. I woke up very early on Sunday morning at about 8 AM. Come on for bachelors that's pretty early when the day is Sunday. I got the prawns and was back home. A cup of coffee and I was ready to prepare for the dish. Mix all the ingredients mentioned under Spice Mix with 1 tbsp water and keep aside. Mix coconut powder with a cup of hot water and keep aside. Hope you enjoy the dish. If your style of preparation is different from the one I shared, do share! Did you fry the prawns in oil before putting them in gravy?? Hi Deepak, no I did not fry it. Frying prawns tend to make it hard. So I avoided it in order to get juicy prawns.